Fusion Guesthouse, Salvador, Brazylia : Rezerwuj teraz! The following group types are not accepted by this hostel: Junior / Primary School, College / University, Business Trip, Stag/Hen/Bachelor Party, Sports Group If you have misrepresented the type of group you are booking for, your booking may be cancelled by the hostel." The historical centre has a great cultural diversity, with this in our mind, the fusion cultural center has a new proposal when it comes to accommodation of people. The guesthouse has 2 floors. On the first floor there is a collective kitchen. You can cook independently or in group. 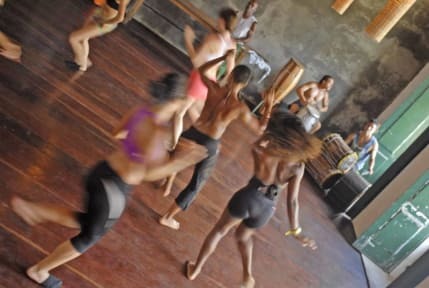 Moreover, the first floor is working as a common area for several cultural activities such as capoeira, afro dance, afro percussion workshops. - 6 beds mixed dorm with en suite bathroom (it is necessary your own lock). - 8 beds mixed dorm with cabinets (it is necessary to have your own lock). - 18 mixed dorm with cabinets (it is necessary to have your own padlock). Blankets at no additional cost. If you book between December 15th and March 15th you will be charged 50% in advance in order to secure your booking (non refundable), you may be contacted by the property requesting for a deposit.